BOSTON – In the dead of winter, Haymarket looks more like a shantytown than a marketplace. Discarded fruit boxes and decapitated pineapple tops strew the surrounding sidewalks and gutters. A few industrious pickers search the debris for carelessly discarded produce. Each stall is enshrouded in tarp and plastic sheeting. A web of extension cords connects stalls to the facing storefronts, powering lights, space heaters and radios. Here, bundled customers can pause inside, scanning the offerings of produce while soaking up a bit of warmth. Amina Boubakkar’s table of live crabs has no such amenities. Perched at the top of the stairs leading down into her brother’s fish market, she sells the crabs out of plastic crates. A slight fishy aroma rises up the stairs from the market below. But today’s wind snatches it away, leaving nothing but a scent of cold that bites at the nostrils. Boubakkar appears to be in her late 30’s or early 40’s and hails from Morocco. Despite the frigid temperature, she is dressed in a white knit sweater, jeans and a faded pink apron. She has no sheeting to protect her from the wind and no heater of her own. She is grateful for the stall across the way whose heater sends a bit of warmth her way. In the bigger booths, English, Spanish, Mandarin and Arabic hurl through the air across great landscapes of produce. Shoppers call out their orders while vendors chant about special prices. One fruit vendor instructs his customers, “Just throw the money at me! I love flying money!” Others employ long-handled baskets to retrieve payment from across the display. Interactions with Boubakkar are more intimate. With such a small table, she can converse with her customers. Today, however, it is not Boubakkar that the customers want to talk to. They prefer to deal with Eli. Eli is Boubakkar’s 7 year-old nephew, and he has come to spend the afternoon at his father’s market for fun. He prefers to work outside with his aunt because he gets to handle the live crabs. Bundled up tightly, Eli collects payment from customers and places their crabs in plastic bags. His aunt supervises, double checking bags and reminding him to count the bills. When asked what the best part of coming to Haymarket is, he replies with a cheeky grin, “To get money.” Then, after a moment, “And that I get to look around and look at stuff and learn about fish.” He talks about coming to the market with the same excited tone he uses to discuss camping and fishing in the lake near his New Hampshire home. To Eli, Haymarket is an afternoon fieldtrip. To Boubakkar these are tough times and this is no game. Eli arrived around 11 in the morning, Boubakkar arrived at 7 am and will stay outside until dark and her crabs are gone. When the weather turns fierce like this, with wind chills in the teens, far fewer shoppers are willing to brave an outdoor market. 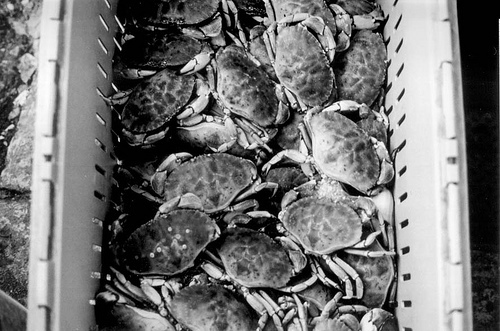 The crabs don’t like the cold either and keep still in their crate. Boubakkar spends much of the day tossing the crabs onto their backs to get them to show some sign of life. Thin crowds and uncooperative crabs make for a slow day. As nightfall looms closer, Boubakkar will likely be forced to slash her price drastically in order to move the crabs. Haymarket is only open two days a week and vendors’ incomes must be supplemented in other ways. Eli’s father delivers fish to restaurants on the off days. Untill recently, Boubakkar worked a second job as a cook. She has since been let go. She is currently going to school to improve her written English and computer skills. For now, all Boubakkar can do is keep an eye on Eli and hope that next week brings better weather and bigger crowds.